I stumbled upon this beer at my local liquor store and by the looks of the new label design (Keith Shore) this beer would be a hop bomb in a bottle. Doing a little research I found out that this is part of a 2 beer series where Mikkel uses a top fermenting ale yeast (High) and a bottom fermenting lagar yeast (low) in the making of a very hoppy beer (for comparison of course). While I was not able to find the IBUs of this beer they have to be above 60. I’m confident his beer was dry-hopped as there is a huge nose upon opening. Pouring this beer into the snifter produced a very light golden color beer with a delightful creamy white head. It was dense and looked a little like whip cream. Playing to my love for lighter malted IPAs I knew this was going to be a winner. The nose was intense and all hops. Floral, honeyed, pungent, citrus, resinous and fruity. There were some earthy piney notes that seemed to be carried by the abv heat, but the aromas were mostly dank and tropical. Pineapple, mango, apricot, orange and a light herbal spice wafted up from the glass. There was a minor sweetness from the malt. For the most part this smelled a lot like 3 Floyds Dreadnaught or Arctic Panzer Wolf. Wow! The flavor was outstanding. Crisp, dry, and highly resinous. The lighter malts offered some quickly passing relief from the hop assault that took place in on my palate. Carried by a honey-like sweetness this beer reminded me a little of Bells Hopslam in a lot of ways. 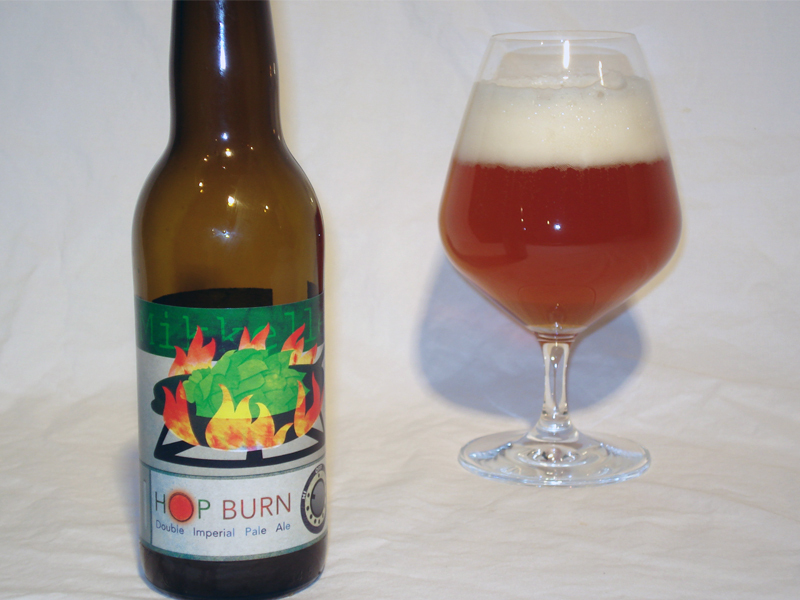 From front to back, Hop Burn ignited my palate with multiple rounds of pungent sticky hops. While these hops stuck around in the aftertaste, the finish was dry as previously mentioned. If you are a hop lover and come across this on your shelf buy it. I promise you will not be disappointed.